It’s been a little over a year since the debut of the B9-generation Audi RS4, the first to go back to a forced induction V6 after two generations of naturally-aspirated V8. Here, our spy photographers have captured the facelifted performance wagon running winter tests. Changes appear to be fairly minimal as this update is a mid-lifecycle refresh, with the camouflage foil on the development car here indicating that changes will be minimal, the revisions led by new front and rear bumpers as well as redone front and rear quarter panels. At the front, there appears to be a mild change to the grille, while the headlamps are expected to receive an update as well. Around to the back, the tail lamp assemblies now sport the multiple elements as seen on the A6 and A7, while rolling stock will also likely comprise a set of new-look wheels. Powertrain, meanwhile, is expected to remain as before – the 2.9 litre biturbo V6 sends 450 hp and 600 Nm of torque to all fours via an eight-speed torque converter automatic in pre-facelift guise. This may or may not see an increase in output come facelift, though the interior may likely receive an updated infotainment system as well as a larger infotainment screen. The post SPYSHOTS: Audi RS4 facelift running winter tests appeared first on Paul Tan's Automotive News. 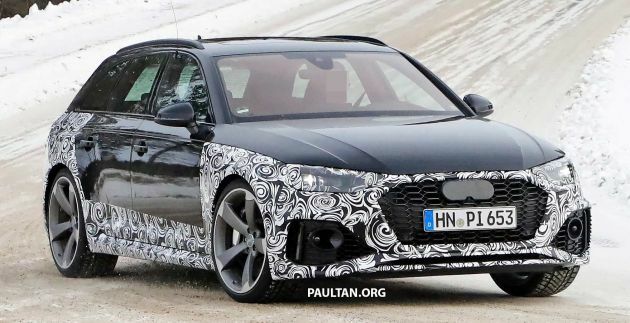 0 Response to "SPYSHOTS: Audi RS4 facelift running winter tests"